Tortoiseshell kittens are very cute but they are also a big responsibility, so bringing a kitten into your home is not a decision to be taken lightly. Your kitten is likely to live for 15-20 years, so you need to be able to provide a warm and loving home for her – and she will respond by making you ‘hers’ for the rest of her life! Your kitten will ideally be at least 10-12 weeks old before you take her home and she is separated from her mum. If she is any younger than this, she may not be mentally ready to be in your home and they still need to learn from their mum in the first 12 weeks. You will need several things to kit your home out for your kitten, including a warm and comfortable bed, a scratching post, a cat carrier and a litter tray. You will also need to stock up on kitten food and arrange for vaccinations and some insurance – just in case she gets ill or has an accident, vets bills can be very expensive. 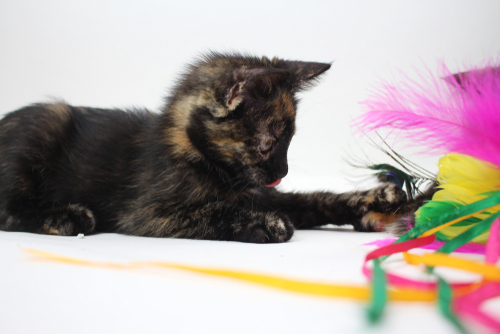 It can be great fun to have a tortoiseshell kitten as part of your family, especially if you have young children as they are sure to love playing with her. Make sure that you have some toys for her – these will keep her entertained and stop her being too boisterous in her play. They do not need to expensive – kittens love playing with cardboard boxes, toilet roll holders and anything with a bell they can follow around such as a fishing line. You should keep your kitten inside until she has finished her first course of vaccinations, which is likely to be at around 13-14 weeks old. You will need to accompany her outside for the first few times – but once she has learnt to use the cat flap she will be out and about enjoying her adventures! This should cover the basics of bringing a tortoiseshell kitten into your home, although there is a lot more to know. The most important thing to consider is if you have room in your family for a ‘tortie’ – and all the fun, love and enjoyment she will bring. My tortie cat Binka will be 20 in May and looking good. She doesn’t look her age. Hi I have a 7/8 month old kitten who I thought was a calico I took her in to get spayed and another woman said wow she’s a tortoise cat. How would I know for sure she’s a tortoise? I Have a tortoishell kitten, named Paris. Atleast, we think she an Tortie! She is mostly black but has some patches of peach colors, baige, and An Orangy type of color! Do You think our cat is a tortie? She’s a 5 month old female By the way! Any suggestions?